Percy is confused. When he awoke after his long sleep, he didn't know much more than his name. His brain-fuzz is lingering, even after the wolf Lupa told him he is a demigod and trained him to fight. Somehow Percy manages to make it to the camp for half-bloods, despite the fact that he had to continually kill monsters that, annoyingly, would not stay dead. But the camp doe Percy is confused. When he awoke after his long sleep, he didn't know much more than his name. His brain-fuzz is lingering, even after the wolf Lupa told him he is a demigod and trained him to fight. Somehow Percy manages to make it to the camp for half-bloods, despite the fact that he had to continually kill monsters that, annoyingly, would not stay dead. But the camp doesn't ring any bells with him. Hazel is supposed to be dead. When she lived before, she didn't do a very good job of it. When the Voice took over her mother and commanded Hazel to use her "gift" for an evil purpose, Hazel couldn't say no. Now, because of her mistake, the future of the world is at risk. Frank is a klutz. His grandmother claims he is descended from ancient heroes and can be anything he wants to be, but he doesn't see it. He doesn't even know who his father is. He keeps hoping Apollo will claim him, because the only thing he is good at is archery-although not good enough to help the Fifth Cohort win at war games. His big and bulky physique makes him feel like a clumsy ox, especially in front of Hazel, his closest friend at camp. He trusts her completely-enough, even, to share the secret he holds close to his heart. 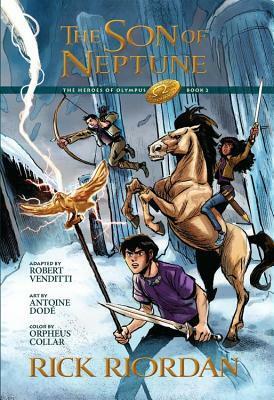 Featuring a faithful adaptation by Robert Venditti, and incredible artwork by Antoine Dod and Orpheus Collar, Rick Riordan's blockbuster book comes to life in The Son of Neptune, The Graphic Novel.